One of the most popular Itoh peonies! Produces up to 80, sweetly fragrant blooms in late spring to early summer. 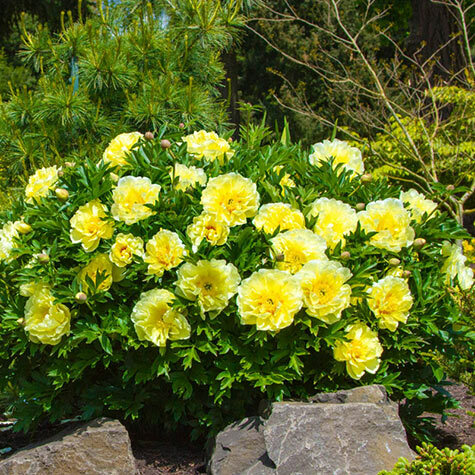 The 7-9 in., yellow, double flowers are eye-catching in the garden and especially stunning in cut-flower arrangements. Grows 24–36 in. tall. 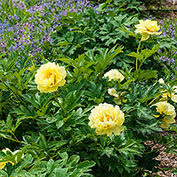 Itoh peonies, a cross between herbaceous and tree peonies, offer many advantages in the garden. Prolific bloomers with large flowers, Itoh peonies have strong stems that hold up to the spring winds and rains. Their dense, rounded form is quite attractive—and their bloom season lasts up to six weeks! They grow best when planted in full sun to part shade. Deer tend to avoid. Zones 3-8. Depth: Plant with eyes approximately 2 inches below the soil surface. If it is planted too deeply, poor flowering will result. Color: Outer layers creamy, becoming deep sulphur yellow with red flames at the center. Foliage: New leaves; dark green with purplish shading. Summer: divided gray-green to green leaves. Fall: usually bright orange & red hues. Winter: leafless, dormant, stout stems. Blooms: Late spring-early summer, opening over a 6 week period. 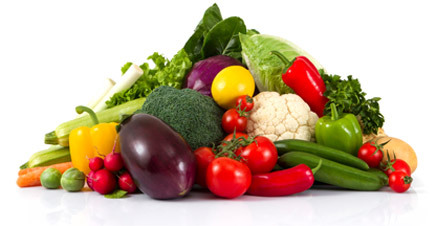 Soil Requirements: Well-drained, rich, slightly acidic soil. Pruning: Dead-head. Remove spent flowers after blooming. Cut foliage to the ground (and remove from the garden) in fall after frost. Size: Flowers are semi-double, 9 inches across. 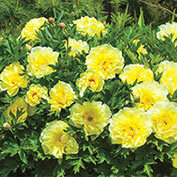 Comments: Very rare plant, an Itoh or intersectional peony is a hybrid of an herbaceous and tree peony. Resembles a tree peony in flower and form (stronger and more floriferous)- shrubby form, flower color, resistance to blight, tolerance to heat, humidity, cold and poor soil, but the culture is the same as an herbaceous peony, as well as large bloom size, superb fragrance and extended bloom season. Itoh's have the best of both worlds and Bartzella is the best of the Itohs. Winner of the Grand Champion Award from the American Peony Society. Blooms for an extra long season and has a citrusy (lemony) sweet fragrance, flowers don't fall over in the rain like herbaceous peonies. Un-surpassed by any other peony in beauty, fragrance or sheer flowering power- can produce up to 80 flowers on a single plant. Superior as a cut flower, last for several weeks in a vase, and scent the whole house.